AUSTIN (KXAN) - One type of dog takes up more space at the Town Lake Animal Center in Austin than any other. Pit bulls have a bad reputation, but there is a renewed effort to get more of them adopted. Nearly one in three of the cages at Town Lake is occupied by a dog classified as a pit bull. "They make up an overly large proportion of the dogs that end up homeless." said TLAC Program Development Manager Amber Rowland. "There is a stigma about pit bulls- a lot of people are afraid of them." 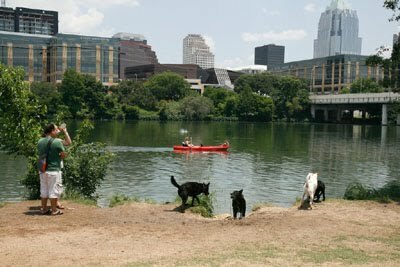 Last year, 48 percent of the dogs euthanized at Town Lake were classified as pit bulls. From October 2009 to July of this year, the number is already up to 44 percent. Dozens of people gathered Tuesday night at a meeting of the Pit Bull Task Force to determine why these dogs make up such a high number of animals left and then euthanized at the shelter. A smaller group has been meeting for years, but the moratorium placed on euthanasia at TLAC has drawn renewed interest. "The Task Force is tasked to try to figure out why is it that we're seeing so many of this particular type of animal and why is it so difficult for them to get out of here alive," said Rowland. "We want to try to get more of them adopted. We want to get out the idea that they are adoptable and can be wonderful family companions." The Task Force is not a rescue group and does not receive city or state funding, although several of the members are city employees. Their purpose is to educate people about pit bulls and try to improve the way the dogs are treated in the community.